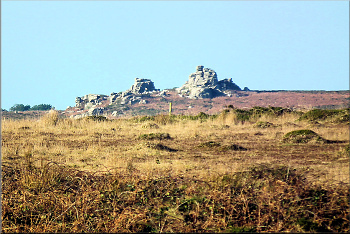 The difficulty archaeology has is that much of the best evidence to be used in research (with radiocarbon dating and other techniques) is organic, and the acid soils of Penwith make them dematerialise. Modern instruments and deductive reasoning don't do too well with stones alone unless they resemble things we are familiar with today. Another difficulty is the secular nature of archaeology, with a consequent lack of understanding of the basis of shamanic, pre-religious, pre-urban perceptions, knowledge and practices. Finally, archaeology labours under the notion that we stand today at the pinnacle of human evolution and therefore that everyone preceding us was rather primitive, superstitious and underdeveloped. This is true from our own modern viewpoint but questionable from that of a wider spectrum of cultures throughout world history - especially ancient cultures before about 1200 BCE. So this has a lot to do with worldviews. It has a lot to do with what is taken as admissible evidence and how such evidence is interpreted. Thus hilltop enclosures have customarily been interpreted as defensive when only in 10% of British 'hillforts' are there any signs of military activity - because we tend to project our own cultural norms back on prehistoric cultures. Actually, they were more gathering places than defensive positions. These things said, archaeology nevertheless carries out very valuable work in producing physical evidence at prehistoric sites, and new, less intrusive technologies and means of data analysis have in recent times opened up many new possibilities in this. Its weakness lies in biases of interpretation which make it more of the kind of pseudo-science that archaeologists accuse geomancers of practising. 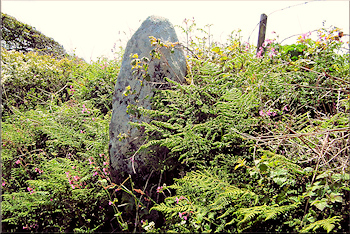 In West Penwith's archaeology, its two main errors lie in ascribing defensive and funerary purposes to many ancient sites - errors that began in Victorian times that have never been corrected. There is therefore virtue in widening the evidential spectrum. 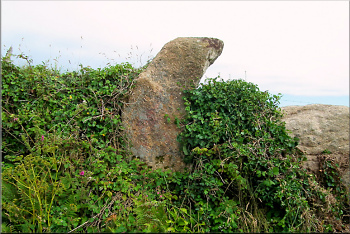 An example: a local archaeologist discovered a new menhir (now dubbed the Seal Stone, SW 3653 2338), but he wasn't sure - plenty of stones in Penwith could be menhirs but they are not. Especially in the case of a strange stone like this (left) - until you realise that it is close to seal caves and points toward them. Here, a 'magical eye' comes in useful. 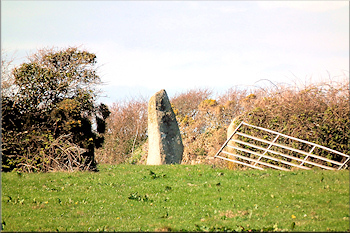 After a little alignment research by using maps, I found that the stone was at the exact intersection of three alignments, two of them extending to significant sites in Penwith. The chances of this happening accidentally, within a two-metre accuracy range, are too slim, so this evidence verifies the authenticity of the stone. 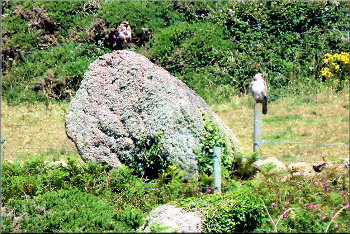 The Seal Stone can now be recognised as a legitimate menhir sitting in its proper location. This serves as an example where the 'inadmissible evidence' provided by geomancy adds evidential value to archaeological discoveries. Without such evidence, this menhir would fail to be acknowledged as genuine. spirit of place or genius loci, the 'presence' or 'soul' of a place. This combination of reasons for building sites defies modern logic, yet it is evidentially observable. Megalithic science was partially intellectual and partially intuitive, made up partly of human ideas and partly derived from observation of nature. On the right are listed a range of factors that seem to contribute to the building and placing of ancient sites, as recognised by geomancers, archaeoastronomers and dowsers. These factors influence and give definition to subtle energy - the feng shui character and purpose of each site. Here was shall look at energy-resonance, underground water and a few other factors that determine this. The Earth is an energy-resonator vibrating at around 8Hz (cycles per second). Modern instrumentation can measure magnetism, electronic charge, radiation, heat, geological tremors and other frequencies but not the full spectrum. The grinding of the inner core of Earth with its outer shell creates planet-scale energy-fields that manifest in patterns on the surface, concentrating in some areas and locations more than others. West Penwith sits on a deep raft of granite that pushes into the Earth more deeply than in other places - underground it is the hottest place in Europe, very suitable for geothermal energy-generation, and the crystalline structure of this granite resonates frequencies not found everywhere. Quartz and mica, around 20% of granite composition, also act like battery-storage, a memory store and energy or information buffers. Penwith is dense in 'earth energy', a loose term for a range of frequencies that can be picked up by dowsers and sensitives but not by existing modern technological measuring devices. Such frequencies transmit easiest through the medium of water, a relatively good conductor, as well as through veins of metal. So these frequencies concentrate in places where the right underground water-flow conditions and metal deposits exist. Penwith has plenty of both. It all centres around blind springs ('water domes' in USA). These are upward-moving seepages or flows of primary water - a by-product of chemical reactions deep within the earth, carrying nutrients and conducting charged geomagnetic and subtle energies upwards. Blind springs are crucial in determining the location of major ancient sites, which are always located on top of them. This is a major clue. Primary water has no hydrological connection with secondary water derived from the rainfall cycle. Rainfall falls to earth, soaks into the soil and is released through springs, streams or the evapotranspiration of plants, to be recycled into the atmosphere, the water table or the sea. But primary water, pressurised and pushed up from below, energy-charged though not so voluminous, rises through fissures, cracks and porous rocks, in small seepages, flows and underground streams. When it hits an impervious layer of rock, or the fissure narrows or becomes less porous, the rising water is compressed, then to seek more horizontal routes. Eventually it mixes into the soil and the secondary water table, sometimes appearing as surface springs. The primary water spreading out through cracks and porous areas underground forms what, on the surface, appear to dowsers as sinuous subtle-energy water lines, radiating out from blind springs, weaving hither and thither and emanating dowsable energy radiations. A blind spring itself creates an energy-vortex at the surface and rising like a whorl or a bubble into the air, and straight overground energy-lines (or energy leys) connect these vortices into a latticework across the landscape. A blind spring can be quite deep down, but those under stone circles and certain other sites seem to come higher up. 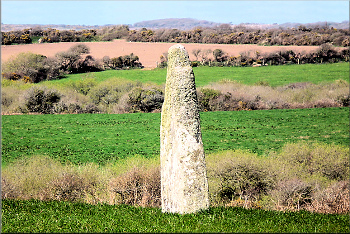 For example, the author finds the blind spring under Mên an Tol (formerly a stone circle) to be 110-120ft under the surface. To dowsers it registers on the surface as a subtle energy centre or vortex from which sinuous radial energy-currents, or water lines, radiate. Some dowsers register these as subtle energy spirals or patterns emanating outward from a central spot. This creates an energy field or power centre upon which major sites such as stone circles and quoits were built. One of the several purposes of stone circles and quoits is to enhance, harness, focus, contain and fix such energy-fields. Sometimes two water lines cross each other, each at different levels or strata in the rock, and an energy-vortex forms at ground level over the crossing point. These have less energy-intensity than blind springs, but the ancients were interested in them nonetheless. Such a vortex usually has an upward, downward or alternating directionality to it, pulsing in tune with the cycles and configurations of the moon, sun and planets of the solar system. This periodicity has not been fully and systematically studied (an enormous task), so we don't know for sure what its patterns and cycles are, or how much they vary from site to site. But it happens, observably. Generally, the upward or downward movement of such a vortex seems to fluctuate or reverse on roughly the sixth day after new or full moon, just before the waxing or waning halfmoons (according to dowser Tom Graves). The maximum upward motion is in the two days before fullmoon, and the maximum downward motion is in the two days before new moon. This is emphasised at eclipses - lunar eclipses are super-fullmoons and solar eclipses are super-newmoons where the lining up of sun, earth and moon are more exact than at normal new and full moons. A study made by dowsers Sig Lonegren and Billy Gawn during the August 1999 solar eclipse over Cornwall found that, for the duration of the exact eclipse, the energy-lines in the vicinity they studied (near Gweek in the Lizard) literally rolled up and disappeared, then to roll out as the eclipse ended - like a re-boot of the underground energy-system. At both of these kinds of vortex locations neolithic and bronze age people built mounds and quoits, or they placed stones or stone circles, and probably also planted special trees, now long gone. The Algonquin people of New England planted 'talking trees' on such spots, training tree branches into unusual shapes - these were trees that spoke, places where you could more easily 'get the message'. The ancients also found that there are overground straight energy-leys connecting these vortices. So a sacred site would involve a blind spring or a water-line intersection, either of which generates a vortex which, above ground, acts like a pulsing whorl of subtle energy. Overground energy-leys would streak in straight lines between these vortices, and the remarkable thing neolithic people found was that such vortices seemed to line up with each other, sometimes over quite long distances. They built megalithic structures on these special places. There is a direct connection between underground water and concentrations of subtle energy, and the ancients sought to exploit this. What is the value of it? Well, if you go to an ancient site you will notice a change in your mood, thoughts, understanding and state of being and a heightening of overall awareness. If you practice meditation or other ways of generating altered states, you will discover certain properties of such energy-spaces that are not necessarily present elsewhere. These might include a capacity to feel downwards to the centre of the Earth, or upwards to the far reaches of the universe, or horizontally toward distant people and places; you might experience profound healing and resolution; you might be able to go back in time imaginally; it is not uncommon, 'by chance', to meet interesting people at such sites or, just when you are about to leave, someone else arrives to take over; you might experience time-warps or paranormal phenomena such as alterations of sounds, or seeing energy or auras (sunset is a good time), or you might gain profound insights or experience a deep peace. There's more - though the acceptability of such propositions depends very much on your viewpoint. By containing and funnelling earth energies, the subtle-energy connectivity between the earth and the heavens is enhanced. 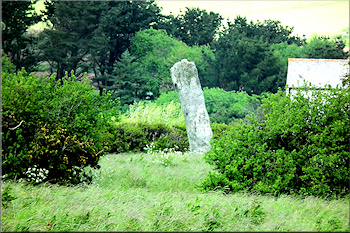 Thus, arguably, menhirs and standing stones act as conductors that smoothe out the varying energy-charges between earth and sky that influence weather, especially moderating weather extremes. In modern parlance, climate control. 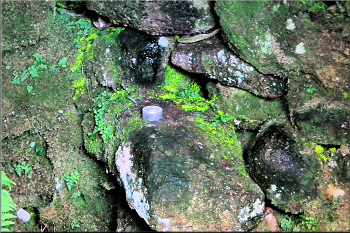 It has viably been argued that tumuli, barrows and cairns, often built with alternating layers of organic (soil) and inorganic (stone) materials, some of them with a stone kerb around them or an urn or chamber inside, act as accumulators, batteries or buffers, or what Wilhelm Reich called orgone accumulators. Ancient sites operate not only with vertical energy-fluctuations but also horizontally - hence dowsable energy-leys between sites and also alignments of them (there's a difference betwen these two, explained here). 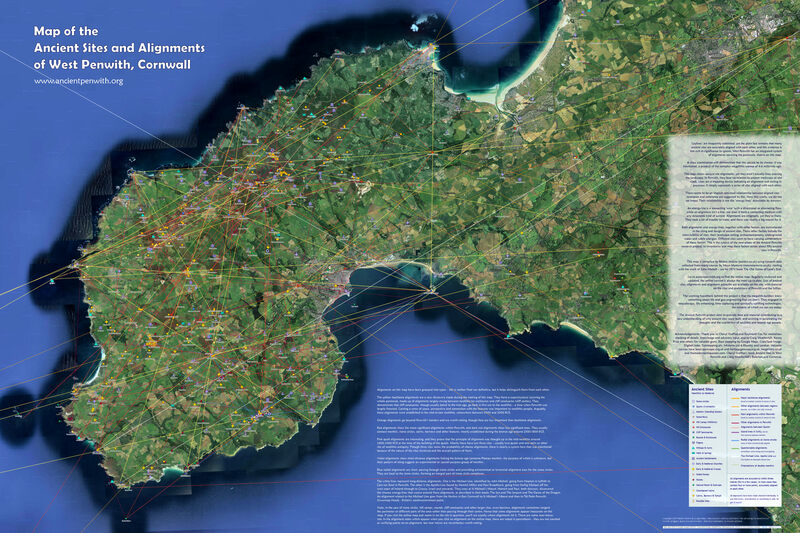 They form a network of energy-centres big and small, operating across the landscape and acting as one integrated system covering West Penwith. These energy-centres create reality-fields where, when you are standing at one of them, it feels as if you are standing at the centre of of the universe. This is the reality-field at work, and in such a space there is more hereness and nowness than at most other places. Chambered cairns and quoits act as energy-concentrators such that items placed or a person sitting inside them are subjected to a concentrated energy-field. Cairns and quoits function as a kind of Faraday Cage, insulating the inner space from outside influences or, in the case of chambered mounds oriented to the rising points of sun and moon at certain times of year, insulating them selectively to highlight a certain time-point in the year (such as summer or winter solstice). But they gather the up-welling energy coming from the blind spring or water-line intersection below them. So we are talking here about an energy-technology that entrains natural forces in the earth and the heavens, focusing it and making use of it for certain purposes. 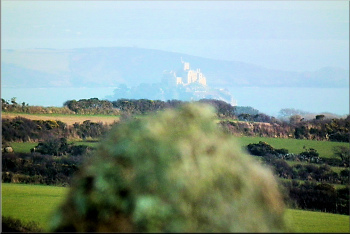 This makes Penwith into a naturalesque kind of geoengineering project that aimed to apply human ingenuity to the regulation of natural and subtle processes, which ultimately would benefit humans, natural bioproductivity, climate, our connection with other realms and realities and the general happiness of humankind and nature. If this analysis is correct, this constitutes an important matter for today, since our planet is in trouble, ecologically, climatically, demographically and socially, and it points to the direction we need to head in technologically. Underground water and its associated energy-fields are not all there is. Remarkably, a number of factors magically coincide at each energy-centre, listed above as locational factors. How this was achieved, we do not know. But a fortuitous coincidence of factors comes together, involving underground water, alignments, at some sites astronomical factors, site intervisibility and landscape setting, all of which combine to generate spirit of place or genius loci. It is this that draws us, consciously or unconsciously, to be interested in ancient sites. This set of principles also gives meaning and purpose to the existence of quoits, stone circles, menhirs and mounds and, without them, we are left with little significant understanding of ancient sites at all.